What finals? Copa? Because Sabella was the coach in WC2014. The myth of Messi not liking Icardi has to stop. The reason why Icardi has not been picked for these friendlies is because he hasn't played for Inter recently and with all the drama with the captaincy with Inter and Wanda. He also wasn't picked for the 2018 WC because Samapaoli didn't think that there was enough time to build team chemistry with Icardi and the rest of the team so Sampa went with the known and trusted (I still believe Icardi should have been chosen ahead of Higuain). There were pictures of Messi and Icardi together back in Fall 2017 in the Argentinian National Team to show that Messi did not have any beef with Icardi. He has been playing really well in City, there is no reason for him not to play with the NT. He never did nothing for NT and there's no ground to believe that it will change. Who cares what he does for citeh. Why is di Maria still there? Why is Messi playing these? Gosh. Nothing against Argentina (always cheering for them when Spain and Italy are out) but why Leo? Why? Why are you going to travel to the other side of the earth to play 2 irrelevant (in the wider picture) friendlies on potato fields against always motivated opposition? Risking injury and added fatigue in this crucial part of the season. At this age as well. In the past 3 seasons (expect for 1 if I recall) Messi has undergone this journey across the world (half across it, some 20.000 + km) and obviously it must have impacted him negatively each single time. 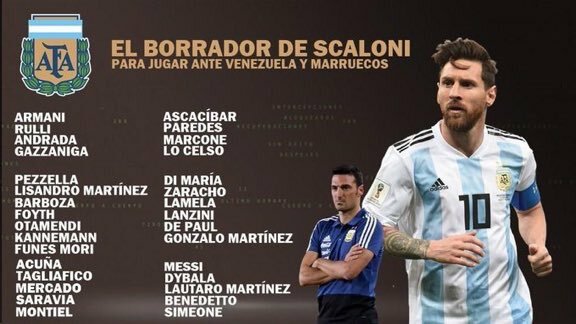 That team from Scaloni (on paper that is) looks horrible as well. Afraid that Argentina won't win the Copa América in Brazil this summer either. Next change will be the World Cup in freaking Qatar in the winter of 2022. Messi should have called it a day after the World Cup like Mascherano did. He and Argentina as a whole have been cursed since the early 1990's. Last edited by Leo_Messi; 7th March 2019 at 03:14 PM. The 1st friendly will take place in the Wanda Metropolitano and the 2nd at Tangier, Morocco, so we're lucky that he's not traveling to far. I also don't think that Argentina will win the Copa 19, but since in this Copa edition Argentina is not the favorite, maybe this could help the team cope with the pressure. I expect them to get out of the group (I mean c'mon haha) and with only 3 knockout games, I'm hoping anything that could go right goes right (Call that my blind faith in this NT lol) You're right that this team is cursed since the 90's and this is with the GOAT. Last edited by soul24rage; 7th March 2019 at 03:32 PM. To tell you honestly, I had no clue about that as I have not been following said news at all. That is very encouraging news at least now that he is traveling with them. Expected another trip half-way across the earth. It's not that bad indeed but it is really not very impressive when you compare it with past Argentine teams from the early 90's until more recently. Would be extremely happy if Argentina won the Copa América, even more so in Brazil and with Messi playing. Will cheer for them in every game but they are cursed. The amount of disappointments that I have had following/watching them (and I am not even a fan but just a well-wisher of them) is something else. The World Cup was the final straw although I missed the 4-3 game as I fell asleep on a plane in the middle of the Atlantic Ocean (obviously above it, lol). Anyway nobody believing in them and most fans having small expectations (although that is hardly ever the case in Argentina where they expect trophies each tournament) could help them a lot and playing in Brazil should be added motivation much like during the 2014 World Cup. Anyway Scaloni is really an unknown for me. Not sure what to expect but I guess that he can only surprise. Mascherano praised him recently during that interview with Vignolo and others. Last edited by Leo_Messi; 7th March 2019 at 03:41 PM.